True, the skiing and riding in Colorado are legendary, but did you know that fun really gets going after the lifts stop running? Coloradans have adopted and amplified the French tradition of aprés ski: Going out, having drinks and socializing after a day on the slopes. Anywhere you end up will have the local’s cure for sore legs (carbs and cocktails), but here are 10 of the top picks around the state. 1. Replenish your energy with pizza and beer (or one of the many crazy cocktails) at the laid-back and amazingly delicious Secret Stash in Crested Butte. It’s got the same chill vibe that defines the whole town — for example, the chairs all look like they belong in a living room. 2. The Red Lion in Vail Village is packed at the end of the ski day, for good reason. The bar is woodsy and cozy, the drinks are strong, and the interaction between locals and jet setters is as entertaining as the rousing songs belted out by the in-house singer. 3. There is no better end to a day of riding Wolf Creek’s famous knee-deep powder than with a glass of wine and a plate of bone-in local lamb at the historic Windsor Hotel's dining room in South Fork. Succumb to the warm lighting and attentive service, and find bliss with one bite of the caramelized pumpkin tiramisu, made with ginger snaps and San Juan Mountain Roasters Coffee. 4. 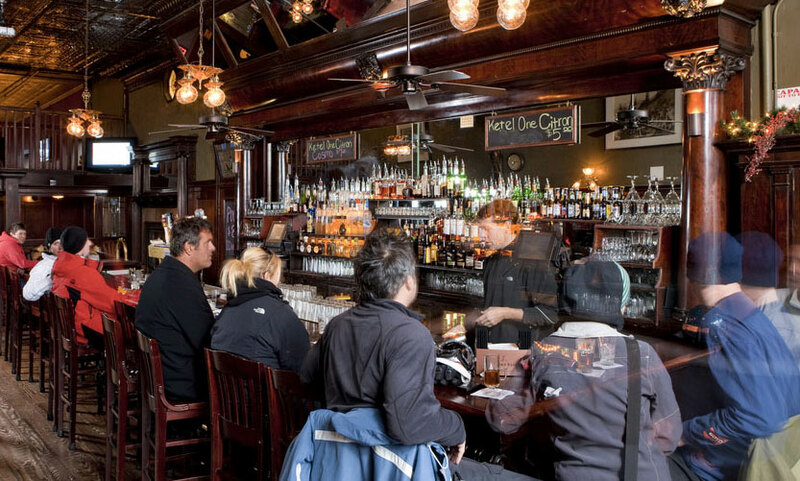 TheNew Sheridan Bar (pictured) in Telluride opened its doors to grizzled miners in it 1895; the mahogany paneling, filigree lamps and lead glass dividers remain unchanged, but the miners have been replaced with satisfied skiers. 5. Soak up a bit of cowboy glamour in down-to-earth Grand County at Heck’s Tavern at Devil’s Thumb Ranch, near Ski Granby Ranch. The oversized leather chairs and center fireplace encourage mingling, relaxing and whiskey sipping. 6. Don’t even bother taking off your gear for aprés beverages at Slopeside Grill in Steamboat Springs, just grab a chair outside in the snow. You can practically ski right up to the bar at the base of the mountain. They also have a menu of pub classics. 7. From the gondola at Breckenridge Ski Resort, Downstairs at Eric’s is just a block into downtown. As you descend the stairs, the luring smell of the best pizza in town takes over. No matter where you sit you can watch the game on tons of TVs. If you’re with the family, don’t miss the arcade area with lots of vintage games. 8. Hit the deck at Aspen’s Ajax Tavern, where you’ll have a full view of the mountain and the menu features five-star bar fare that’s prepared farm-to-table-style. Try a Colorado-made microbrew or signature martini. 9. Make sure you have a few singles in your wallet when you go to Hernando’s Pizza Pub in downtown Winter Park, where every square inch of wall space is covered in decorated dollar bills. And, locals know that nothing soothes sore legs like pizza and brewskis. 10. The beer is made fresh in-house at Wild Mountain Smokehouse & Brewery in Nederland near Eldora Mountain Resort, and so is the mouthwatering smoked meat. The place is custom built so you can continue to soak up that Rocky Mountain sunshine on the huge patio. Photo courtesy of The New Sheridan Bar.